FINISHER'S CHOICE™ lacquers are water resistant, high solids nitrocellulose lacquer. 'Top Coats' are a higher solids lacquer for use on bare wood or to build finish thickness. FINISHER'S CHOICE™ lacquers and sanding sealer perform like a spray gun applied finish. when rubbing out will be necessary. other H.Behlen / Mohawk aerosol lacquers. then apply a final coat or two of the Jet Spray DEAD FLATT. For Touch-Up, and to blend Lacquers into the surrounding finish, use the Jet Spray™ Aerosols. Clear Nitrocellulose based Lacquers are recommended as topcoats for wood grain finishes. Use for the touch-up and repair of existing furniture and cabinet finishes. The lower solids seal, protect, and provide the correct sheen adjustment to repaired areas. and to blend well into existing finishes. the higher solids Top Coat aerosol lacquers are recommended. Pre-Cat lacquers feature excellent flow out for touch-up use. The dry film is very durable and adheres where other finishes will not. • Excels in flow-out, adhesion and hold-out. • Fast-drying, resistant to yellowing. • Leaves no halo on spot repairs. for furniture factory touch-up on pre-catalyzed finishes. A good choice for kitchen and bath cabinets. moisture resistant, Vinyl Lacquer Sealer with good atomization. 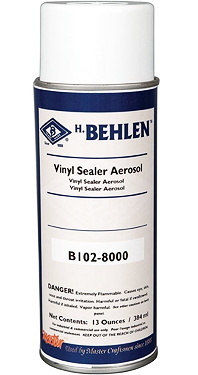 Vinyl Sealer lays a perfect foundation for Stringed Instrument Lacquer. It’s also a great sealer for any topcoat whether being used for spot repairs or an entire finish. a moisture resistant finish suitable for spot repairs on kitchen and bath cabinets. 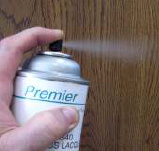 Stringed Instrument Lacquer aerosol, uses the same formula as our 'SIL' packaged in quarts and gallons. 'SIL' is formulated specifically as a high-quality finish on thin, flexible tone-woods such as those used in stringed instruments. Instrument Lacquer is made to withstand the expansion and contraction that is characteristic in the unique construction of stringed instruments. that should be used under Behlen Stringed Instrument Lacquer. This combination yields excellent sound quality. Acrylic coatings are crystal clear and non-yellowing. to retain clarity and color a Water Clear Acrylic is the answer. Clear Acrylics may be sprayed on almost any surface (wood, metals, etc.). Acrylic aerosols are compatible with Behlen & Mohawk touch-up products. formulated for superior adhesion to metal surfaces. Lacquer for Brass will keep brass and brass-plated surfaces bright and looking new. for use on non-ferrous metals to prevent tarnishing, and for corrosion protection. Adhesion to metal surfaces is excellent. Blush Eraser™ is the tool you need if you work in a humid, damp, or cold climate. Humid or cold weather can cause a finish to turn white or "blush". to escape without changing the existing sheen or shade of color. Eliminates the need to sand off or chemically strip the damaged finish. Light applications over white rings will, in most cases, remove white rings and water spots. More than one application may be needed. Caution: Do Not Flood the area, overuse can melting or running of the finish. or "halo" prior to top-coating with a clear lacquer finish. are formulated with exactly the right amount of solids. without blushing or over-spray under normal conditions. High humidity or cold weather can cause a finish to turn white or "blush". RETARDER / LEVELER is an effective blush remover in an aerosol. Use for those extreme blushing conditions that need to be corrected. The leveling solvents help eliminate over-spray or 'orange-peel' roughness to yield a smooth level finish. Also used for redissolving and/or improving the flow-out of a previous lacquer application. Shellac in a spray can is perfect for crafts and small projects. This finish yields a lustrous glow that won’t darken or yellow with age. For Best Results - Be sure surface is clean, dry and sound. Remove any wax with mineral spirits.